Ambro.com provides two ways to get training for your team, and we’re building a third way. We have been conducting the most sophisticated in-person custom sales training seminars for 20 years and conducting custom webinars for a decade. These sessions are designed in consultation with you to address the sales issues you have, with examples specifically selected from your industry. Ambro.com methods can be applied to all sorts of advertising-media sales, from local to national, and from in-person to telemarketing. Ambro.com sales techniques are especially valuable for major account advertising sales to grow sales to big accounts and to break through on major opportunity accounts you don’t currently do business with. Make more and bigger sales by getting more appointments, by calling on higher-level buying executives, being more persuasive, handling objections better and closing more deals. Learn more about the strategic advertising sales course. Advertisers know they need more than one media to be successful. We train your team to sell a complete solution: Internet, print, events, sponsorships, television or video, outdoor, whatever you media you sell to create advertiser success. Learn more about the selling integrated advertising course. Advertising sales training programs to train your team to sell all the latest forms of digitally delivered advertising for web sites and mobile; including social media, native advertising and all else. Learn more about the selling digital media advertising course. The most successful advertising sales plans and processes require proper marketing support. This training shows how, exactly, to maximize sales productivity with effective marketing. Find out more about how to make your team’s sales efforts more productive with the marketing for advertising sales course. 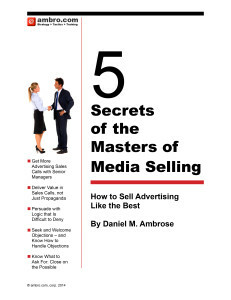 Ambro.com conducts public, free and paid, and private webinars to teach the most sophisticated advertising sales skills available. Learn more about the webinars for advertising sales course . Contact Us for more questions or a fee quote on sales training. We are developing a new service that will be “on-demand” training available on a subscription basis to the public. We will be launching a complete “Strategic Sales Tactics” class that will provide all the training you’ll need to bring a new sales person up to an elite level quickly; time and territory management, getting appointments with the right prospects at the right time, engaging, persuading, probing and handling objections and finally closing. Sign up for The Advertising Sales Imperative free e-letter, so you don’t miss the free-introductory opportunity at the launch.